James at the time of his marriage was a school teacher. [S4] Vit - ON - Marriage Registration, 011865-91. Benj. 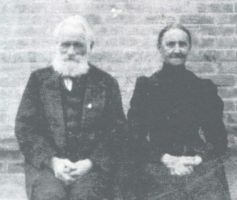 & Nancy, witn: Robert COLEMAN & Leah ROSENBERGER all of Wilmot, 4 November 1891 in Wilmot. [S20] News - ON, Waterloo, Kitchener - Berlin Telegraph (title varies: Berlin Telegraph, Berlin Daily Telegraph) (1853-1922), 10 Jan 1862. "Coleman - Steen: On the 31st ultimo, by the Rev. Jno. McMechan, Mr. James Coleman, School Teacher, to Miss Lydia Steen, daughter of Mr. John Steen, all of the Township of Waterloo." [S655] Vit - ON - Birth Registration, 35340 (1876), Lydia Coleman..
[S655] Vit - ON - Birth Registration, 901183 (1931), Ernest Coleman..